On Saturday 25th February 2017 students from Wantage took part in the 11th Annual Oxfordshire County Cross Country competition at Chiltern Edge School. We had runners representing the school in every age group from Year 1 to Year 6. In Year 1 Jack sped home finishing in 5th place closely followed by Theo, Jaspar and Ben. In the girls Eliza and Cate both finished in the top 10. In the Year 2 race Rose led the girl’s home finishing in 2nd place followed by Annie 5th, Mikayla 6th, Annabel 8th and Imarnie in 10th place. In the boys Albie, Harvey, Patrick and Marcus all ran well finishing in the top 20. In the KS2 races there were individual standings as well as a team standings. Starting the races were year 3 girls, Kara finished in 4th place closely followed by Olivia 8th, Charlotte, Jessica and Emily all finishing in the top 20 to complete the team and securing the team 3rd place overall. The boys’ team had 4 finishers in the top 20 – Rowan, Freddie, Zachary and Thomas also finishing in 3rd! 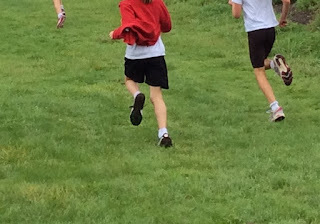 Poppy led the year 4 team home finishing in 9th place, followed closely by Estelle in 12th. The boys’ team all finished closely with Oakley 15th, Harry 16th and Alfie 17th. Rachel powered home for the year 5 girls finishing in a very respectable 3rd place. In the boys Caspar secured a gold medal finishing in 1st place to be followed by his team mates Alex 7th, Ethan 13th and Daniel 16th, securing the boys first place in the team event. In the Year 6 boys, Alex led the team home finishing in 5th place closely followed by Max, Alfie and Matthew and coming 2nd in the team standings. The girls in year 6 did not have a full team however Emily led the girls’ home in 23rd place closely followed by Celia in 36th place. The results from all the races are put together to award a school with the overall county Champions for 2017. Wantage CE finished in a fantastic second place overall! Well done to everyone who took part.